This fun Caterpillar craft for kids is so easy to make! We based this craft off one of our favorite books, The Very Hungry Caterpillar. We read the book several times a week and it's one of those classic books that most people have read with their kids at one time or another. It's the perfect book to create a simple craft with. Kids love this book and they can't wait to make their own very hungry caterpillar! You only need a few basic supplies for this caterpillar craft and it's so easy but the end result is an adorable little caterpillar. Begin this simple craft by having your kids cut the green construction paper into strips. We cut six strips for each of our caterpillars but you can make yours as long or as short as you want. You will also need to cut one strip of red construction paper. This red strip will be the head of your caterpillar. 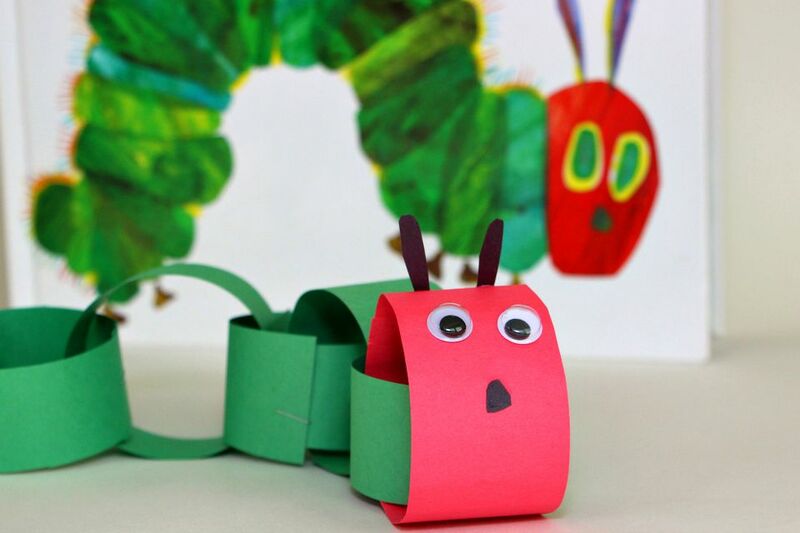 Making this caterpillar craft is the same as making a paper chain. Create a circle with one green strip of construction paper and staple the ends together. Next, thread another strip through the circle you just created and staple it together in a circle shape just as you did the last one. Continue until you have a chain of green circles stapled together. Attach the red strip of construction paper last. When you are done stapling the construction paper together it's time to make the features for your caterpillar's head. From the black construction paper cut out a mouth and two antennae. Glue mouth, antennae, and googly eyes onto the red construction head. We pinched the back of the red construction paper together slightly so that the antennae would stick out over the head. You can also wait until the glue dries and then bend the antennae piece upwards to create the same effect. Once the glue is dry you have a super cute caterpillar craft to display in your home or classroom! We like to use ours when we read the book, they kids pretend he is eating along with the caterpillar in the book.